Back in the 1980s, it wasn't enough to have a successful toy line. To really capture the imaginations of children all over the world, toy companies partnered with other forms of media to produce cartoons, comic books, and every other tie-in imaginable (lunch boxes, cereal, etc) in an effort to push their properties into the consciousness of consumers eager to spend their money. It sounds awful when you look back on it today, but it wasn't awful for those of us who grew up during the heyday of cross-marketing consumerism. Many of us (myself included) believe that we were lucky to have been born during a window in which imagination ran wild, birthing a golden age of irony-free fun. We had He-Man and the Thundercats and Darth Vader to fuel our playground adventures, and the toys in our rooms when we got home from school. The adventures were on our television, in our toy box, and in our comics. Those comics, in particular, gave us something that the shows and toys themselves never quite did: depth. Television shows like Transformers, Thundercats, and G.I. Joe were most definitely extended toy commercials, sometimes good, but sometimes not. I can still enjoy many of them for what they were, but I recognize that some people can't go back because the stories are often so simple and cheap. One thing aging fans agree on, however, is that the comic books based on some of these toy lines took things to the NEXT LEVEL. They were able to tell stories in a different way, giving us tons of character development and loads of action with consequences. 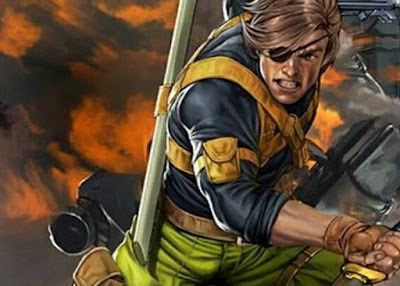 No comic book better typifies what I'm talking about than Marvel's run of G.I. Joe. From 1982 to 1994, the comic book adventures of the 3 3/4 scale toy line took readers to places they never thought they'd go, and accomplished something unbelievable. What started as the fairly straight-forward adventures of a covert military team soon evolved into a HUGE tapestry of intrigue that involved martial arts, murder, deception, mind control, and double--no, triple--no, quadruple--crosses.That original 155-issue-run It was largely the work of one man, Larry Hama, an icon for comics fans and the single person that's more responsible for the enduring success of the G.I. Joe toy line than anyone else. Sure, some sculptors and guys in a board room actually created this stuff, but he brought it to life (and wrote all the file cards for the action figures, too). His comics treated the premise seriously and took readers on a roller coaster ride every single month. 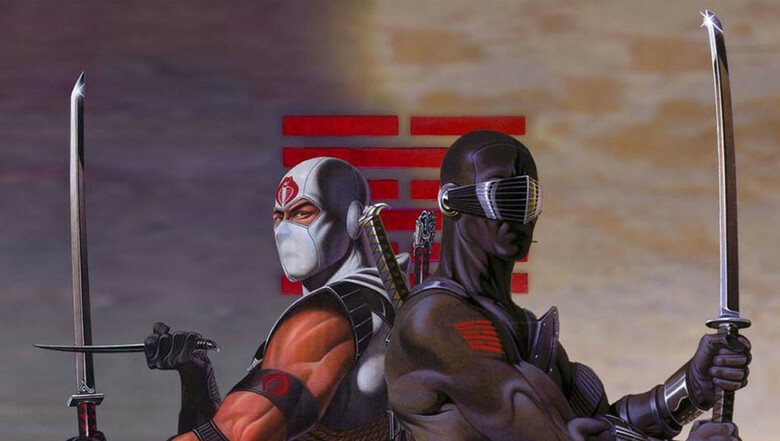 Larry Hama is the reason that guys who are forty years old have tattoos of the Arashikage clan, those red lines that Snake Eyes and Storm Shadow bore on their arms. These guys read the saga in the comics and it made such an impression on them that they've made it a part of them permanently. Hama drew on his own military experience to craft stories that had one foot firmly planted in real military tactics and practices, and the other completely in fantasy. For kids who were into it, it was as good as it got. 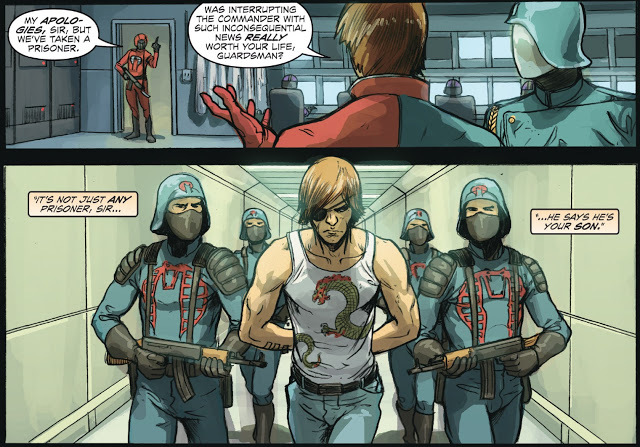 For my money, no tale from the comics is more interesting than that of Billy, the son of Cobra Commander. Over the course of years, Larry Hama crafted something that was both escapist in nature and also incredibly relatable. 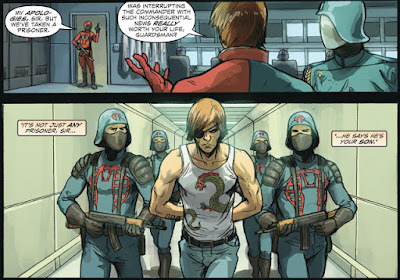 Billy Kessler (an alias, not his real name) is the human baggage caught up in Cobra Commander's quest for power. In the cartoon adventures of the Joes, Cobra Commander was a caricature, always yelling, always blaming his minions for incompetence. He had no levels or layers. He was evil because he was the bad guy in a cartoon and that was that. Larry Hama wove a very different tale. In the comics, Cobra Commander was once a used car salesman who became increasingly disillusioned with the American status quo. As his frustration drove him to rage (think Michael Douglas in the movie Falling Down), he became more and more obsessed with tearing down the conventions of power as they existed (think Tyler Durden in Fight Club). His wife and child were caught up in his descent, and he eventually left his wife, took his son Billy, and moved to the town of Springfield, where he began recruiting other terrorists and eventually succeeded in corrupting the entire town. Larry Hama's decision to leave the location of Springfield deliberately vague was brilliant. He knew that just about every State has a Springfield. What happened there could happen anywhere. It could be happening right next to YOU. Brainwashing is a plot device that comes up a lot in the saga of Billy, but initially there wasn't an actual brainwashing device used by his father. No, the real brainwashing was the damage a dad can do to his kid just by being their father. Kids inherently want to look up to their parents, and Billy was no different. Hama conveyed the complicated nature of the story very well. You ever see an interview with the kids of someone who has done something horrible? They can recognize the act itself as wrong, but they still love their parent because it's in their DNA. So when Billy eventually turned against his father, even going as far as to attempt to assassinate him, it was a big deal. And that's when things start to get REALLY interesting. Over the next few years, Billy became a lot of things. He was a junior member of G.I. Joe, invaluable because of the inside information that he had on his father. He was a student of Storm Shadow, learning the ways of Arashikage as he attempted to become a ninja. Yes, he was also brainwashed and recruited back into Cobra, his father's terrorist group. Through it all, the reader was engaged because Billy was a KID, a teenager who should have been worried about tests and meeting girls, not dodging bullets and trying killing his father. Billy was always a pawn in someone's game. Sometimes it was the good guys. Sometimes it was the bad guys. Sometimes it was mercenaries who had no allegiance at all. When Billy was involved in an car explosion that cost him his eye and a leg, it felt real. Cartoons definitely didn't show any real violence or consequence, but here in the pages of this comic book was both, and it mattered because it was different. Ultimately, Billy was his father's weakness. Again, the Cobra Commander of the cartoon was a joke, but the Cobra Commander of the comic book still had a love for his son, somewhere under all the anger and paranoia. He wanted his son to carry on his work, wanted to teach him what he had learned. When he found out about Billy's accident and the subsequent coma (a kid in a coma? In a comic book?! ), he pulled back from his violence and had a real crisis of conscience. Many issues later, Cobra Commander would survive yet another assassination attempt and betrayal to become much closer to the crazy guy from the cartoon, but when he eventually ended up at that place, it made sense. He'd had his very innermost circle, his FAMILY, turn against him. 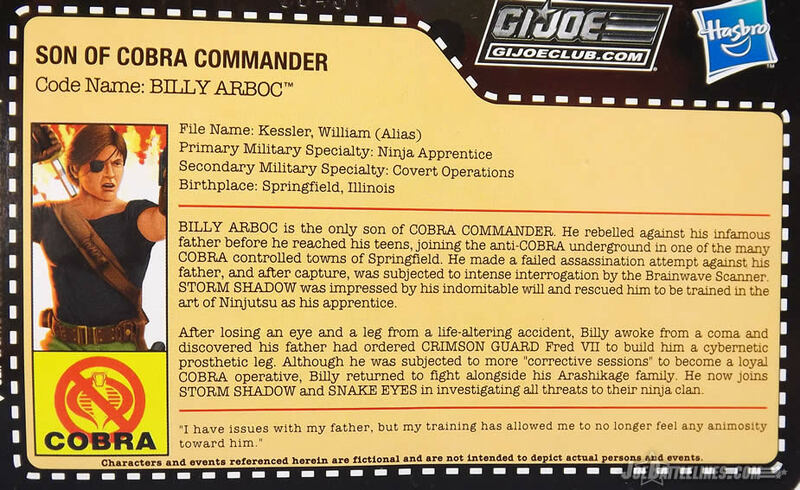 Billy was the Achilles Heel of Cobra Commander. There's simply no way to highlight all the twists and turns that the character took over the years, but I think it's definitely worth looking into. And rather than reading about his stories on some wiki, I recommend digging into the original 155 issues of Larry Hama's G.I. Joe comic book, which is always being republished in increasingly-fancy editions. 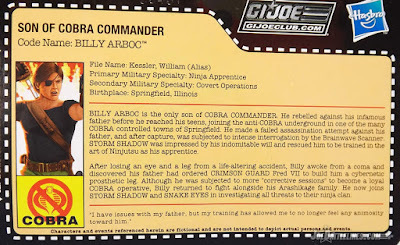 People always talk about Snake Eyes and Storm Shadow, even Destro or Zartan, but we can't forget how important Billy is. When Devil's Due Publishing revived the G.I. Joe comic book in the early 2000s, Billy was one of the key figures in their stories. Because time had passed, they were able to depict Billy as a grown man who had completed his training, now a valued, full member of the G.I. Joe team. This opened the door for further storytelling opportunities and further conflict with his father. Even the later IDW comics recognized the importance of the character of Billy, making him a fundamental part of their series. Some things have been retconned over the years as is the case with all mythologies, but a lot of it remains the same. In current continuity, I believe Billy is deceased, but we're talking about comic books, where anything is possible. 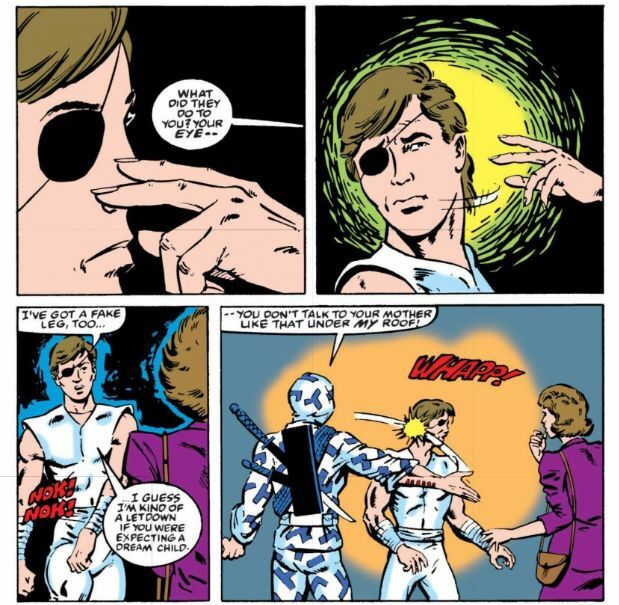 All it takes is one editor to wipe the slate clean and Billy will once again be caught right in the middle of the never-ending battle against not only Cobra Commander, but his own feelings toward a failed father. I kinda forgot about Billy. I only had scattered issues of the old G.I. Joe comics and I mostly remember him as being in a coma from the Brainwave Scanner I think. For comic book original characters though I did have the issue with the final showdown (at least until the IDW stuff) between Kwinn and Doctor Venom.